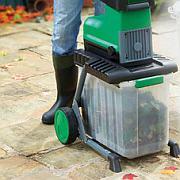 From Thursday 4th September 2014 Aldi are offering a 2500 watt garden shredder with a 60 litre collector. Dear Mr Langeraar, I have the same problem. Were you ever offered advice? One way or another did you work it out and can you advise me? I’m not that computer literate so the simpler you make your reply the better, please. The problem for me is how to separate the switch from the body.